Temecula Valley Southern California Wine Country celebrates Springfest as a collection of special events and things to do during the months of March, April and May. Temecula Valley Southern California Wine Country celebrates Springfest as a collection of special events and things to do during the months of March, April and May, such as Santa Rosa Plateau vernal pools, Temecula Rod Run, Temecula Family Fair, Reality Rally, Taste of Temecula Valley, and Temecula Valley Balloon & Wine Festival. Wrap midweek getaways around special events and linger through less-busy weekdays to explore Old Town Temecula, experience Pechanga Resort & Casino, and enjoy Temecula Valley Wine Country. Temecula resorts, hotels, and motels offer special Sunday-through-Thursday, better-than-weekend nightly room rates. Welcoming 2.6 million visitors each year, the casual picturesque Temecula Valley is located 60 minutes from San Diego, Orange County, and Palm Springs; and 90 minutes from Los Angeles. Santa Rosa Plateau vernal pools are full and creatures are in abundance, including fairy shrimp, frogs, dragonflies, hawks, falcons, coyotes, scaups, buffleheads, and the rare-for-the-area Eurasian wigeon. Hikers also enjoy beautiful views and a variety of trails. Santa Rosa Plateau offers a fascinating glimpse into the history and ecosystems of the area. Consisting of 9,000 acres, the Reserve protects unique ecosystems such as Engelmann oak woodlands, riparian wetlands, coastal sage scrub, chaparral, bunchgrass prairie, and vernal pools; as well as more than 200 species of native birds and 49 endangered, threatened or rare animal and plant species, including mule deer, mountain lions, badgers, bobcats, western pond turtles, white-tailed kits and fairy shrimp. Of the two species of fairy shrimp that live in the seasonal vernal pools, one is found only here and nowhere else on earth. SIP Passport provides an exclusive weekday discount that allows visitors to sip award-winning wines produced in beautiful Temecula Valley Southern California Wine Country without the large crowds. Each guest chooses five wineries from which to enjoy a standard wine tasting flight. The SIP Passport, available through March 31, not only offers convenience but a savings of up to $30. Passports are available for $45 at http://www.temeculawines.org/events/temecula-valley-winegrowers-events.php?events_id=65. Reality Rally Temecula Valley invites reality show fans to visit past contestants and watch them in an amazing Race-style game featuring 120+ reality stars from 40+ TV shows on April 8 & 9. Saturday evening will feature a Celebrity Chefs Competition. Taste of Temecula Valley will be held April 29 & 30. Guests can enjoy sampling food from 50+ local restaurants, award-winning wines of 12+ wineries, and craft beers from 10+ microbreweries in the center of historical Downtown Old Town Temecula. 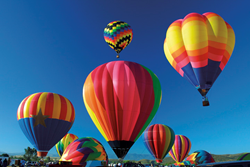 Temecula Valley Balloon & Wine Festival will be held May 20-22 at Lake Skinner. The Festival offers top name entertainment, hot air balloon flights at sunrise, wine tasting, kid’s faire, arts and crafts, commercial exhibits, and food. Wine tasting features some of Temecula Valley’s premium wines. Pre-sale tickets are available at http://www.tvbwf.com. For more information about what to see and do this spring in Temecula Valley Southern California Wine Country go to VisitTemeculaValley.com/Springfest.